Dewhirst, a leading supplier of clothing to retailers, is a company with a rich and interesting history. It was founded in 1880, when wholesaler Isaac Dewhirst created one of today’s most successful retailers after introducing the two men who were to become Marks & Spencer. Isaac Dewhirst quickly became a preferential and significant supplier for the Marks & Spencer chain, but he always retained the independence of his own business. Still apparent today, this ethos has seen Dewhirst grow rapidly since its inception. The company now has 12,000 employees in countries including Bangladesh, Indonesia, Cambodia, China and the UK. Dewhirst has a proven ability to respond to a fast-moving market via a global infrastructure, a highly responsive portfolio of services and a growing number of specialist divisions. The business very much relies on data and its manufacturing division includes information crucial to its day-to-day work. 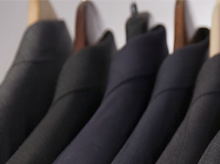 In order for Dewhirst’s business to run smoothly, it must be possible to access data such as all styles of clothing; how much fabric is available; the amount of available raw materials; and how much of the product is in cutting rooms and warehouses. Because this information is needed for the firm to fulfill orders, it is integral data is constantly available, even if something goes wrong.